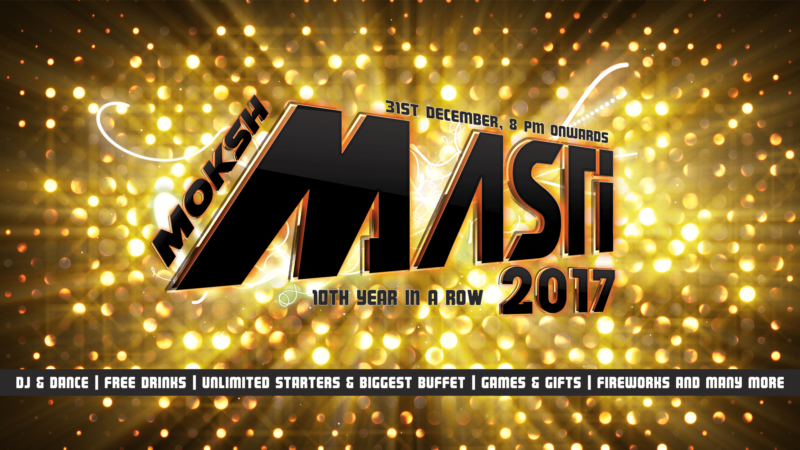 Moksh Masti 2017 at Moksh banquets is the tenth edition of the new year bash at the Moksh banquets, which is located facing the scenic Hussain Sagar lake. A new year party that is ideal for the whole family to revel in the celebrations of the new year and new beginnings, this party has a dedicated kids zone for your tiny tots. Leaving your kids with nannies, neighbors, or your parents is a nice option. But, there is nothing like seeing your bundle of joy making new friends and having fun, while you celebrate with your friends. So, here is a place you can head to in the heart of the city. Moksh banquets will have two party halls, one where you can show off your dance moves while the DJ creates a magical mix of the chartbusters. And you will get to savor the best of delicacies from the chefs at the other hall. This will be teamed with a few complimentary beverages that every guest will be served with. If you wish to sneak out to some peace and enjoy the breathtaking view of the beautifully lit Hussain Sagar lake, you can do so on the sprawling lawns, and while you are at it, make sure you do not miss the fireworks. These fireworks will mark the disappearance of all the eerie feelings that you had in the year past and the prospects of a bright and nice future in the coming year.